Expert tips on navigating the secondhand and surplus scene. (SPOT.ph) These days it feels like there’s a mall, or a soon-to-be-mall, popping up on every corner. While they do offer multi-storied convenience-and free air conditioning!-sometimes it pays to get sidetracked into the often messy, but always rewarding world of hard-to-find secondhands, surplus bargains, and out-of-the-way thrift shops. 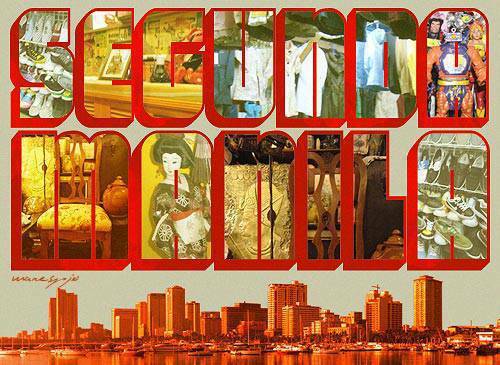 In other words, the world of Segunda Manila. 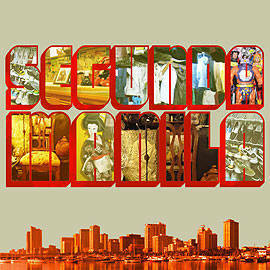 More than a field guide or listing of shops-for that kind of thing, allow us to kindly direct you to links like these and these-Segunda Manila is all about the experience of shopping beyond the usual. In the first of this series, we’re tackling furniture, fashion, and toys. Fashion, furniture, and fab toys, all at bargain-bin prices. Click on the next page for more. Create a pretty nook by the window, then use it for a quiet afternoon of reading your favorite book. 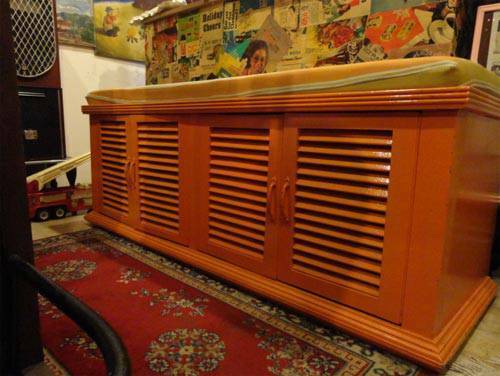 This secondhand find was from a homeowner in Paranaque. Store owner James Yango painted the piece himself, erasing scratches and other signs of wear and tear. The previously leatherette seat cushion was also re-upholstered with fabric. Why the shop is worth a visit: Innovatique-from the words "innovative" and "antiques"-offers refurbished previously owned items. Walking into the store will have you up to your elbows in retro finds in vibrant, youthful colors. Take your pick from the garden chairs, aparador, clocks, and various knick-knacks that are both quirky and fun. This Queen Anne-inspired dining chair used to be part of a six-seater round dining table, shares shop owner Ernie Yango. 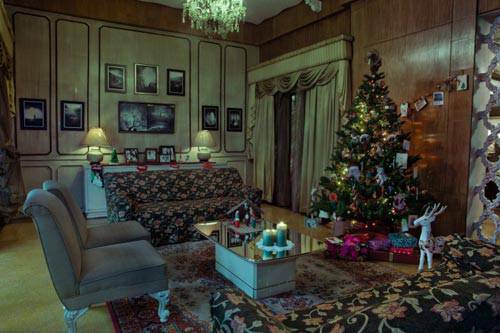 A homeowner in Anonas disposed of it, and Ernie cleaned and waxed it, then changed the upholstery. Now, it's ready to give a touch of vintage to your home. Why the shop is worth a visit: If Innovatique is all about quirky and colorful, The Grand Thrift Shop specializes in restored vintage finds. Here, you will see an abundance of pieces that hark back to the good old days, like bauls, lamps, vinyl records, and even rotary telephones and radio cassettes. Browsing through this wide array is a delight in itself. Just be careful not to bump into anything, as the compact store is packed to the rafters. 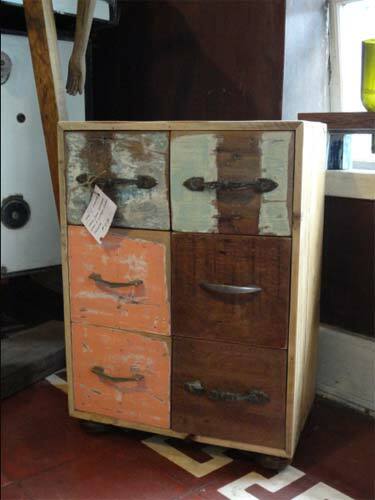 Aside from letting you score eco-friendly points for patronizing a salvaged find, this chest of drawers gives you additional storage space to keep your abubot in-and its small size makes it perfect for those living in condos and apartments, or working in a tiny home office. Its distressed look exudes an artsy vibe, thus giving your space character. Why the shop is worth a visit: Visiting Resurrection Furniture and Found Objects Gallery will let you see "junk" repurposed into functional items. You'll be impressed with the store owners' ingenuity: clocks made from a kitchen door, bookends from old vinyl records, among others. Updated vintage items also beg for your attention. Aside from the shop, 10a Alabama also hosts different events, so make sure to check out their Facebook page to stay posted. This set is definitely a steal; nowhere else can you find similar pieces at this price. 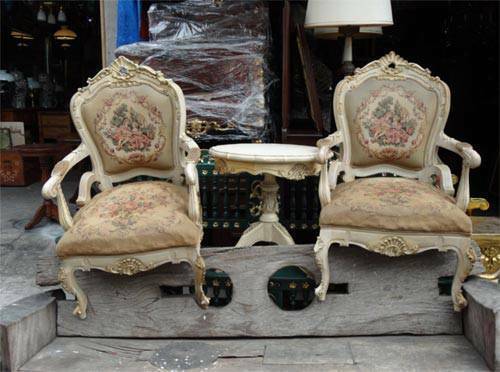 These French-style armchairs and café table can be placed in a corner to create an elegant sitting area. You can also use just one of the chairs as an accent piece in your living room, then use the rest somewhere else. Why the shop is worth a visit: Evangelista in Bangkal, Makati is well-known for thrift shops and bargain finds. 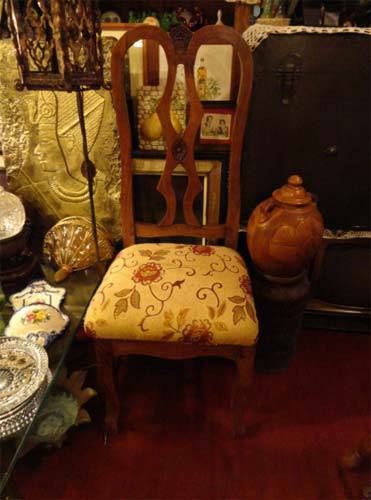 The row of secondhand furniture stores on Gen. Hizon Street alone is teeming with a variety of pieces-accent chairs, dining sets, cabinets, vases, lamps, decorative items, and more. Evelyn's Thrift Shoppe is among the first stores you will find when you turn left on Gen. Hizon Street from Evangelista Street. Particularly eye-catching are the curvy, French-style pieces. Don't forget to haggle to bring the prices down. An escritoire is a rarity nowadays; it's not among the finds you commonly see in malls or furniture stores. 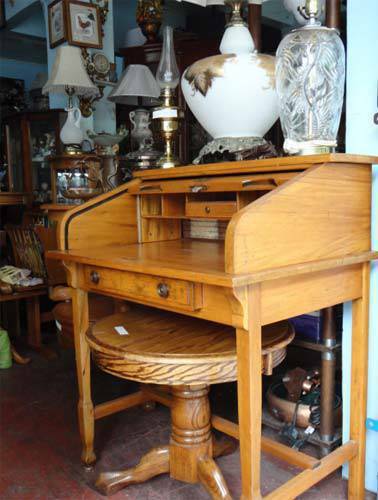 This writing desk, despite being secondhand, still looks new with its polished wooden exterior and sturdiness. You can take home a nostalgic piece that sends you back in time when writing longhand was still the norm. Why the shop is worth a visit: Dante's Furniture Shop offers secondhand items from the U.S., mostly wood, but you can also find porcelain plates and other knick-knacks. The furniture pieces are solid and steady, hence their durability. 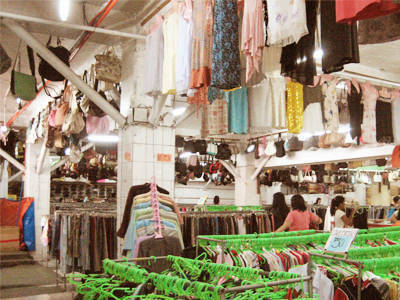 They are affordable, too, as Bangkal is known for its low-priced finds. Katherine Lopez is the staff writer for Real Living magazine. 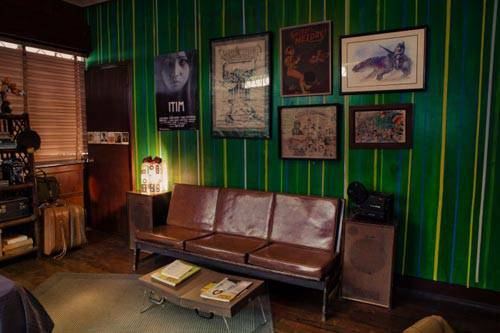 Looking for really, really rare stuff for styling places like film sets or music videos? First, make sure you have time. Second, don’t go on weekends. Once those are in the bag, you’re ready to go! But where should you start? Production designer Trinka Lat has five very useful hot tips for you-not just about where to go, but about what to do and what to look for. Set photo from Ang Nawawala. Photo from Trinka Lat’s site. 1. Head over to Evangelista, Makati. It's actually like three streets or three and a half blocks of houses that they converted into thrift shops. They don't do specifics...there's one store that does a mix, just lamps and lampshades and glassware, and there are other stalls or houses that carry furniture. There were these two rattan armchairs, really really comfortable and all they needed was varnish-I got the set for P450! They’d easily go for P1,500 if they were new. That’s the kind of deal you get with places like this. Basically, the more organized a shop is, the more expensive. The more bodega-like establishments, you can sift through and you'll find some gems. 2. Go down to the Kamuning Swap Meet. It's a two-floor building right at the corner of Edsa-Kamuning. The owners usually start opening shop at 11 or 12. There's a store there that has really small collectibles-toys, phones, postcards, old pictures, medals, radios, bottles. It's a little bit pricier, but the owners of some of the stores are usually around, so it's easier to haggle. Never go to a shop dressed up. It's easier to charge you a higher price if you look good. 3. Scout around Cubao X. Even the frontage-the MSM Surplus Shop-has gems in it. You never know what you'll find: golf clubs; a blender that you can turn into a lamp. Regular thrift shops don't carry stuff items like kitchen appliances or golf clubs or baseball bats. And by stuff, I mean good stuff. You can get rollerblades there! It all depends on the timing. You have to be masipag. You go to the same place several times over the course of a week, and there will be new things. You have to scour. Avenida is a gem. It's an entire street filled with Marikina-slash-Korean supplied shoe stores, thrift shops, ukay-ukay. And they have this really huge Japan surplus shop that has everything everything: boxed teacups, teapots, Japanese dolls, furniture, mats, curtains, toys, cutlery, weird stuff. Never source when you're in a hurry. The best finds actually happen when you take your time and you never expect to find an item. With Avenida, never go on Saturdays because the traffic is horrible. 5. Ask your neighbors and your older relatives. The pick-up line here would probably be, "Hi, do you have anything in your house that you consider junk and that you're willing to sell?" I was doing a music video-"Akap" for Imago. We needed 20 parols. So we called our neighbors, and we each got 10 parols: 10 from White Plains, 10 from Filinvest One. What I've realized with older people is, once they get into the age where they have so many possessions, and they've actually forgotten how to appreciate things-when you ask to see their old items, they tell stories of how they acquired it, how they came to love it, and at the end of the onversation, they’d say, "I'm not using it anymore, maybe you want to buy it?" Trinka Lat was the production designer and art director for "Ang Nawawala", "Keka", and various film projects both here and Berlin, as well as music videos for Sandwich, Orange & Lemons, and many other bands. I started doing ukay in the mid-90s, in the Bambang market muna, and then I raised it a little, as in umakyat ako ng Baguio. 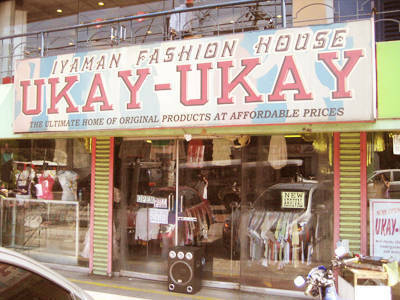 We would go there just to make ukay sometimes. The retro craze was so big that time, I think because Miuccia Prada came out with a lot of vintage-looking stuff, and you’d find a lot of ’70s knits and pencil-thin wool pants sa Bambang. I’d wear it to nights out in Malate, or in my dayjob at Manila Times, everywhere. For a while, I stopped going to ukay for no reason, and then just recently, if I have time I would go to the ukay in Aurora Boulevard, across the Mercury Drug sa may Gateway. Hansel’s, I think it’s called; yung nasa 2nd floor. The finds are not as great as they were during the ’90s. Siguro kasi iba na rin ang hinahanap ko, and I’ve become less conscious of trends. I go to ukay now just to occasionally help stretch my wardrobe. When you get older, you start getting attracted to the more sedate things. Although I am still drawn to the Montaguts. I buy mostly shirts, recently of the simple polo shirts variety: oxfords, white cotton longsleeves, etc. I never really venture into the pants racks because its just too complicated: I am short and thin and most of my own pants have been altered to fit me, so I doubt I’d fine anything there. I don’t venture into the shoes either; I don’t really like the idea of putting my feet inside shoes that’s been worn by other people. I never look for brands. I always just look for things I like. I treat my ukay trips as a more leisurely shopping trip. You never really know what you’re looking for, you’re just in it because, who knows, you might find something useful or, better yet, inspiring. You’re not too scared to make a mistake because it’s cheap. And you can always give it to someone. Although I’ve never really given ukay stuff as gifts: first because I never know what people think of ukay, baka they find it yucky wearing other people’s stuff. Second, because I don’t really like looking for clothes for other people, if I’m not into them at the moment. 1. There are dates for when the new deliveries come, and you can just ask the attendant for that information. Time your visits around these dates so that you have more options. 2. Look out for tsismis: fashion-speak for little holes, missing buttons, stains, and other undesirables. Jerome Gomez is a senior writer at Esquire Philippines. Once upon a time, toys, comics, and other collectibles may have been strictly for kids, but that was ages ago. Now, with the explosion of geek culture, toy collecting is a serious hobby. But if the first thing that pops in your head when you think "toy shopping" are the names of big, mall-based chain stores, well, it’s time to expand the shopping repertoire for the geek in your life. The second floor of Shoppesville Plus (Shoppesville, Greenhills Shopping Center, San Juan) is the undisputed epicenter of action figures. The lower floor boasts some very fancy toy shops, but it’s the second floor where you can score some cheap finds. Whether it's from cartoons, video games, comics, or anime, you’ll probably find it here. 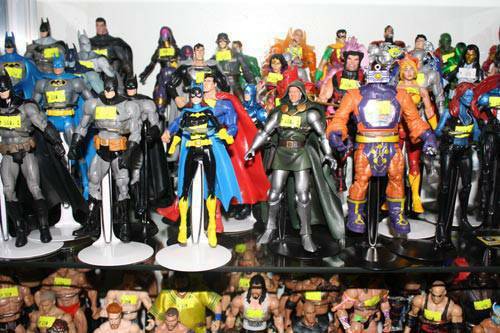 "Loose" action figures-that's collector-speak for toys sold without their packaging-abound, and while most of these are secondhand, price varies depending on quality, rarity, and popularity. Now that the Araneta-corner-Quezon Avenue underpass is complete, getting to Halina Kabayan Ko (113 Quezon Ave., Sto. Domingo, Quezon City) will be more of a cinch. This ridiculously underrated thrift store not only has a great stock of furniture and electronics, they’ve also got an extensive range of on-the-cheap action figures, stuffed toys, and manga, all ported straight from Japan. Sometimes, they even get rare collectors’ items, like Japanese dolls that they sell for P2,000 to P3,000. Poke around the MSM American Surplus (809 Edsa corner Scout Borromeo, Quezon City) here to find model cars, dollhouses, trikes, figurines, and collectibles. Their small, loose figurines can go for less than P50! Want to go large? They also offer plastic playhouses and Schwinn bikes, for sale in the low five figures. The best part about MSM is how accessible it is. It’s easily hoof-able from the MRT GMA-Kamuning station. If you see an open warehouse with bikes hanging from the ceiling, you’re there. 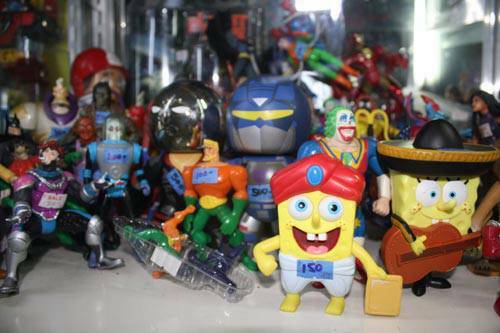 Prices in toy conventions and toy fairs aren't significantly different from Greenhills prices or online quotations, as these sellers are essentially the same people. Buying toys there is more of a community thing. However, if you happen to drop by a con on the last day, some of them may slash their prices for some truly awesome deals. If you want to check a con out this year, Collecticon is an annual collectors' event held every October in Robinsons Place Midtown (M. Adriatico, Ermita, Manila). Before moving to Spot.ph, Lio Mangubat was the toy editor for K-Zone Philippines for six years.